There’s an old saying that women and cats do as they will, and men and dogs must make the best of it. I think our sheep have been talking to the cats. Evening chores around here consist of giving the stallion his grain and supplements, changing the irrigation water in summer, shutting the chickens in their coops, feeding the pigs and locking up the sheep. We’re particularly keen on getting all the most vulnerable critters shut up because we have periodic visits from mountain lions, bobcats and bears. My daughter and I have been shouldering the evening chores together recently because the ram has turned obstreperous. He came at me on a dead run the other day and nearly knocked me you-know-what over teakettle. If the small fry hadn’t hollered in time for me to whack him with the feed bucket, he could have done considerable damage. So now one of us plays spotter with a handy stick while the other opens the pen and puts in the hay and grain. Last night we got a late start, so tonight we went out a good twenty minutes earlier, with the idea of getting everything done before it got too dark to see. We were incentivized by a recent cougar sighting just up the road and a deer that looked as if it had been slashed by the same. I don’t know about the rest of you, but I would just as soon not be stumbling around in the dark when there’s a cougar making the rounds. Things were going well, until the sheep decided they didn’t know us, had no interest in crossing the pasture to get in their nighttime abode and besides, we smelled bad. We shook the grain bucket enticingly, called encouragement and were met with utter indifference. I walked across the pasture and they collected into a small group just out of reach to stare at me. Arm waving was blithely ignored. I picked up a stick and tossed it in their direction in hopes of spooking at least one. 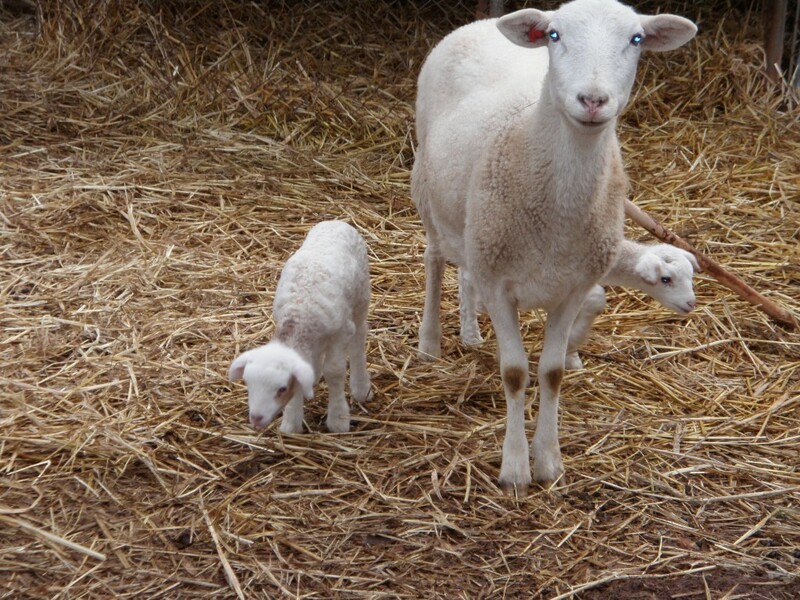 Sheep tend to follow – like, umm, sheep – when one of their number bolts. The stick landed with a resounding crash; the sheep gathered around it as though convinced I had just tossed them a fascinating new toy. Darkness was rapidly descending upon the land. I called to my daughter to bring the feed bucket. She trekked across the pasture and they watched placidly. Finally, she got close enough for them to see that she really did have goodies. Suddenly, they were ready to follow. In fact, she had to whack the ram to keep him from climbing into her pants pocket. I followed the parade, singing “Little BoPeep.” My daughter told me to shut up. This entry was posted in Farms and tagged animals, bears, bobcats, chores, cougar, katahdin, sheep. Bookmark the permalink.